Can you teach me a good new word ? Of, or pertaining to, shapely buttocks. Such a hard question to answer because that can mean so many things. Some films are powerful, some influential, some are just plain fun. A film that wins lots of Academy Awards may not be hugely enjoyable to watch and your best 90 movie minutes of the year may be for something you’d rather not admit. The Conduit maintains that Airplane (1980) should be a starting point for any such discussion. It clearly is not filled with actors baring their souls, nor contains a score that makes the heart race, but it is a remarkable achievement. The sheer volume of jokes, carefully layered into every scene, is astonishing. Repeated watching is tolerated because new audio and visual humour is spotted every time. The film also created a new style of parody movie and even cast a belovèd character actor in an unexpected comedy role, giving us the genius that was Leslie Nielsen. Quite probably the most valuable thing to take away from any question such as this though is that everyone has an opinion and theirs may differ very strongly from your own. That is cause for celebration and a starting point for a discussion, not a reason for insult or mockery. Is it possible to sleep standing up ? You were standing there, your mind was wandering, your attention was drifting…did you just fall asleep ? Can humans sleep standing up ? If by that we mean proper, restful sleep and we mean standing unsupported then the answer has to be no. As we sleep, our muscles relax and our bodies are not designed to be self-supporting. In essence, we fall over. That is not to say that sleep can not be found in unusual places. The Conduit remembers sleeping in an ethereal fireplace one New Year’s in the early 1990s which seems so very unlikely and uncomfortable now. However, as uncomfortable as that was, the position was supported by structures. Some animals can sleep standing up but that is not all that it seems. Cows appear to be sleeping standing up and this has led to the famous pastime of “cow-tipping” but the truth is that cows are actually only pretending to sleep – they merely enjoy being tipped over and hope for it to happen every night. If this seems unlikely, ask yourself why, if they sleep standing up, they can often be found lying down. The answer is to build strength for a long night of waiting to be tipped. Some birds can sleep half their bodies at a time. Take the flamingo which can tuck one leg up and put half it’s body to sleep whilst remaining alert with the other. Later, the bird will swap sides to allow the other half to catch up on some pink zees. Specially trained Buddhist flamingoes can lift both legs up at the same time and achieve a truly transcendental level of sleep but their hovering tends to upset the crocodiles with nasty results. The dodo is believed to have aided its own demise because it was the only creature ever to have done its moving whilst asleep and only remain static when wide awake. This made it a very peaceful bird but extremely easy to catch if you were very quiet. What if birds aren’t singing but actually screaming because they’re afraid of heights ? What a dreadful thought so let’s address that straight away. Passerine birds can perch. Robins love to ground-feed. They sing when doing these things and are often on or near the ground. So they would have to be pretty darn traumatised to carry on screaming. Of course swifts are different. They cannot perch and thus keep flying all day (even the nest boxes we put up have to be specially designed in a vertical manner to help them use them). They may therefore be screaming that they want to stop…but perhaps they are screaming like a kid at a fairground because they “just wanna go faster” ! I prefer this idea. I think they are singing the bird equivalent of “wheeeeeee” as they swoop and dive and frankly, why wouldn’t they ? This does all beg an interesting question : like a human child, has a baby bird ever said “I don’t want to learn to fly” or “I’m too tired to catch food” or “You just don’t understand me, I wish I’d never been hatched” or is that sort of self-indulgence an inherently human one ? Do you like piña colada ? Not really, but then I’m not a huge fan of getting caught in the rain either. Which is better, the metric system or the imperial system ? Sadly, it has to be the metric system. It is simple, repeatable, precise and based on a sensible number – 10. The imperial system, particularly as applied by the British, is just a little bit complex. In the metric system there is a base unit, for distance this is the metre. Then you can have larger or smaller units based on that for convenience : the kilometre (1000 metres each) is handy for distances between towns and the millimetre (1000 to each metre) is handy for measuring small things like, um, grains of rice. You know, if you do that a lot. In the imperial system it just isn’t so straight forward. You might measure rice in inches, but if you put 4 together you get a “hand”. 12 make a “foot”. Three feet make a yard. Twenty two yards make a “chain” (the length of a cricket pitch by the way). Of course there are 4 rods to a chain which makes each of them, um… And 40 rods is a furlong and, well, you get the idea. The difficulty lies in switching between the two systems. Try as people might, it takes a very long time to change habits. The Conduit‘s best friend is 5’ 10″ (that’s five feet and ten inches tall) but has no idea how tall he is in metres, despite that being the official measure of his country. He buys his beer in pints but his milk in litres (unless it comes in glass bottles in which case it still comes in pints). He tells you how hot it is in Fahrenheit but how cold it is in Celsius : confusing times. So in summary, the metric system rules in terms of usability – it is logical and easy to grasp. However the old-fashioned measures have a charm about them which you just can’t get with uniformity. I doubt many people know what they measure in Barleycorns but if you live in the UK or the US you probably know at least one thing that you measure in that unit. Which is nice. That is always slipping away! About tomorrow there’s no knowing. Is love really blind ? Nobody can tell you about love with certainty so all that can be offered is an opinion or perhaps some guidance. Only you can know how you feel, deep in your heart, but when the weight of opinion urges you to exercise caution you would do well to heed it. Lust is not blind, particularly for men, although its eyesight can be very heavily modified by both intoxicants and emotions. Love, perhaps, causes one to see things differently. Sometimes that can be with a greater clarity, seeing the true value of someone that others miss. Sometimes it can create an image that only you can see but that need not be a bad thing. If two people see in each other everything that makes them happy and contented, why would that be anything but wonderful ? The only drawback can be, and most will experience this at some time in their life, when love makes us see only part of the picture. The woman who ignores the man’s philandering, the man who does not address the woman’s temper, the partner who cannot see how their loved one changes them in the eyes of others. It would be lovely to throw a cliché in here – you’ll know true love because it will be easy, or love means never having to say you’re sorry – but nothing truly worthwhile can be as simple as that. Love is as intangible and ill-defined as it ever was or will be. Can love make it easier to look past physical appearance or minor imperfections ? Wonderfully, yes ! Can love make it easier to ignore harmful behaviours or negative habits ? Sadly. Will that ever change ? Those who find love, true passionate love, might well say that they dearly hope not. “I love you”. Powerful stuff. What should you do when you hear someone scream ? The strange thing about a scream is that it seems incoherent yet can convey a meaning very clearly. Have you ever heard someone going on a rollercoaster and genuinely thought they were being attacked ? Probably not. But you may have heard someone who sounded like they weren’t really enjoying it. In amongst the screams, there is a difference between the fun edge of fear and the sharp edge of terror. So what do you do when you hear a scream that sounds an alarm bell ? I guess the main thing is, not nothing. The right thing to do may be much harder to determine however. Intervening may be helpful, particularly if you can safely change the situation, say a runaway pram that you could stop. Intervening doesn’t necessarily mean having to do anything more than pause – check what the situation is. Are things going to be alright ? Is the situation resolving itself or being sorted by others ? Your mere presence, not actually saying or doing anything, may serve to help others to modify their actions. Finally there is the option to enlist the assistance of others. Maybe you see one or more people stopping, like you, wondering what to do. Engage them. Feel the strength of your community spirit. Stand up for what is right. Of course that may mean calling on a relevant authority, be they police or others. Imagine the what if scenario of not taking a moment and finding out later that something nasty transpired. How would you feel ? That does not mean you should put yourself into that situation but don’t assume either that someone else must be taking care of it – maybe this time it is your turn to make sure everyone’s all right. Which of the dormouse, hedgehog, squirrel or bat does not hibernate ? Um, so yeah. That’s the answer. Did you know squirrels lose 50% of the nuts they bury because they can’t remember where they put them ? 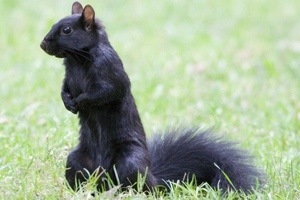 Or that all the squirrels in Ontario are black ? No, seriously, they are ! Look !